Silos Córdoba has just done the commissioning of an innovative project in Sri Lanka to store paddy rice. The ultimate target is to maintain the maximum quality of the paddy rice during the storage period. Our company has had the opportunity to design, manufacture and erect the complete project, which has a total capacity of 5,400 m3, which will be stored in 5 silos. Reducing costs. 100% of the paddy is unloaded by gravity, this means 0 operational costs while unloading silos. Avoiding damages. Mechanical damages on the grain during unloading are avoided since there is not a sweep auger. Greater versatility. 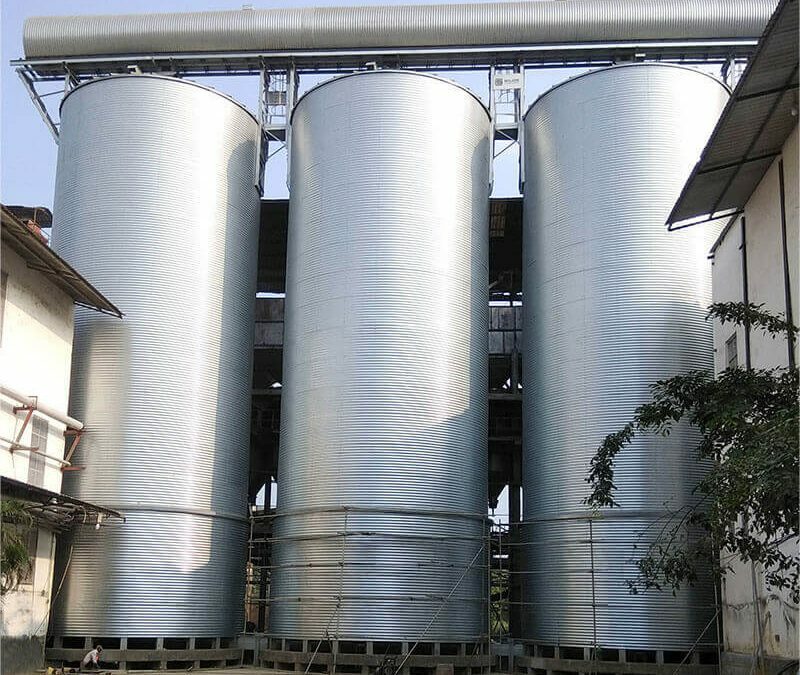 Five silos allow to store different paddy varieties. It is important to highlight the insulation system of silos: they have a double wall ring system with a gap in between where we have installed glass wool to avoid the increase of temperature inside the silos. For higher efficiency and grain maintenance, silos are completely sealed, making the cooling process faster. In addition, silos are equipped with an automatic temperature monitoring system. Regarding the handling equipment, we also evaluated the technology available in the market and in order to avoid mechanical damages, belt conveyors were installed both for the loading and unloading process. Last but not least, the complete project integration was also designed and supplied by our company: integration of all equipment, electrical panel with connectors and integrated software for the operation of the storage plant.